Boost your energy with these sweet treats, packed with nutty protein. 1. Place cashews and macadamia nuts in a food processor and blend until finely ground. Pour into a bowl. 2. Add soaked medjool dates to processor and blend until you have a smooth paste. 3. Add nuts back into the processor and blend until well combined with the date paste. 4. Roll into 1 tablespoon balls and place on a tray with baking paper. Place in the freezer for 40 minutes. 5. Using a double boiler melt your chocolate in a small bowl. Place balls into bowl, cover in chocolate and remove with a fork (so excess chocolate drips off easily). 6. 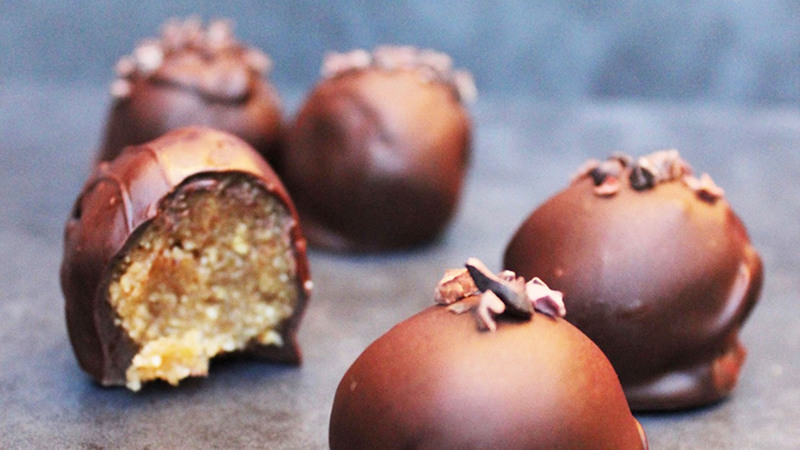 Place balls back on the tray and sprinkle with raw cacao nibs (do this quickly before your chocolate sets). Once set place your truffles in a container in the fridge. Find more delicious recipes at Bodhi Organic Tea.